Cleaning a ball by rubbing it on the putting green. This is permitted (Decision 16-1d/5), providing the act is not for the purpose of testing the surface of the putting green. However, it is recommended that a ball be cleaned in other ways to eliminate any question as to the player's intentions. 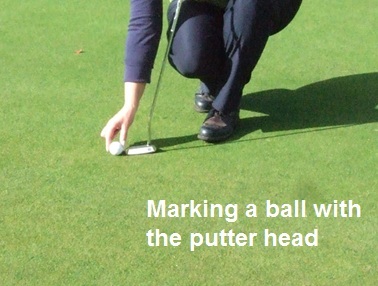 Placing a club, usually a putter, in front of a ball when addressing it. Even though this unusual pre-shot routine means that the player is touching their line of putt on the putting green, it does not incur a penalty. Rule 16-1(ii) specifically permits this action, providing the player does not press anything down. If they do press their club down on the ground as they address their ball they incur a penalty under Rule 13-2. An even worse practice than the one above is when one player marks all the cards for the group, including his own scores. Perhaps surprisingly, this does not breach any Rule of Golf, but in my opinion Committees should introduce their own club regulation to prohibit this lazy and potentially inaccurate practice. Not marking the nearest point of relief or club-lengths when taking relief. The Rules do not require that these limits are marked, but it is best to do so to ensure that it is obvious that the drop is made within the permitted limits. Not marking your ball when lifting it to take relief. Rule 20-1 means that players only need to mark a ball before lifting it if they are going to have to replace it at the same spot (unless a Local Rule does require marking before lifting, e.g. ‘Preferred Lies’). However, always marking your ball before lifting it under the Rules is a good habit that could avoid an unnecessary penalty. Not putting recognisable identification marks on each ball played. Time and again players find that they are not able to positively identify their ball in play. Rule 12-2 states that each player should put an identification mark on his ball. Playing out a hole in a Stableford competition when no points can be scored. Although Rule 7-2 confirms that strokes made in continuing the play of a hole, the result of which has been decided, are not practice strokes, players should avoid doing so, especially if it could delay the play of others in any way (Rule 6-7). The same Rule 6-7 could be applied to players who spend time in retrieving abandoned balls from water hazards. This can be frustrating to fellow golfers and should be avoided during competitive rounds. (Edit 17th January 2014: Thanks to Neville from Australia for this addition) Golfers are usually careful about not stepping on another player's line of putt or through-line, yet they have a habit of leaning on their putter. Using your putter as a crutch when removing the ball from the hole must create a small irregularity in the putting surface, especially if you use the toe of the putter. Using a putter to lift a ball out of the hole, as it may damage the lip of the hole. The above bad practices on the golf course may annoy and frustrate fellow competitors or opponents and can sometimes lead to penalty situations. Try to avoid them, so that you, and those that you play your rounds with, can all enjoy your games. If you would like to receive my weekly 'Rhodes Rules School' photo series by email click on this link. i have been questioned recently about standing close behind my partner when he is taking his putt, is this a breach of a Rule? Your recently blog says that it is not abreach of a rule to stand behind a fellow competitor, although it is poor etiquette. I have seen rule 14-2 mentioned in other emails but to me the ecception in 14-2 almost contradicts the rule. It seems to be a matter of whether the action was Deliberate or by accident (inadvertent is the word used in the exception. So, if you are standing behind your partner while he putts in order to see the line then you incur a penalty; if you just happen to be standing there and are not doing so to check the line then there is no penalty. When a fellow competitor stands behind a player there is no breach of a Rule, but it is bad etiquette and the player would be perfectly entitled to ask them to move. hi Barry, regarding one player marks all the cards for the group, including his own scores. Where does this person sign the card, as marker or player or both places. What then if one person marks all the cards but one other in the group signs his card as being the marker, so the 'group marker' can sign as player. Is this covered by a rule. Decision 6-6b/1 rules that there is no penalty if the player and the marker sign the score card in the wrong place. So, providing both have signed the card it does not matter where on the card they have done so. Whilst the practice of a person other than the one keeping the card signs as the marker is unsatisfactory, there is no Rule prohibiting it. However, it is my opinion that the Committee should be informed, as it is obviously not possible for a player to attest the accuracy of a player's 18 holes if they have not been keeping a record. if a player is not required to mark his ball position and/or nearest point of relief prior to lifting his ball to take relief, how can a dispute as to whether or not he actually took the correct n.p.o.r be resolved? we have a member at our club who seems to consistently choose "best point of relief" rather than n.p.o.r. In my opinion, the most likely reason for a player getting nearest point of relief (NPR) wrong is because they do not properly understand how to determine that point. If I saw someone dropping their ball outside of the area permitted by the Rules I would stop them and ask them to show me how they determined their NPR. I would then show them how the Rules require it to be determined. Of course, they can then pick-up their ball dropped at the wrong place and drop again at the right place without penalty (Rule 20-6). "there is no penalty if the partner is inadvertently located on or close to the line of play......"
but your interpretation said "if you are standing there in order to check the line" there's a penalty, if not, no penalty. With respect, that cannot be right. How do I, as one of the opponents, possibly know the partner's purpose in standing there and observing? Surely, the critical word in the rule is "inadvertent", in other words, if the player's partner is seen to be about to putt, the partner must not stand on the line extension, as stated by the rule. Only if he clearly is NOT observing can the penalty be waived. Yes, you are right. Your interpretation is worded much better.